Terry is shocked to see Shane with another woman - although it's all quite innocent. Shane isn't impressed that Terry won't listen to his explanation. 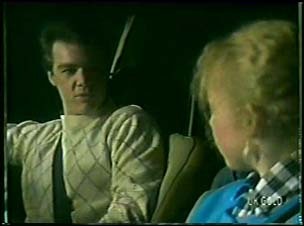 Wendy tells Danny that she's going out with Scott. Shane and Maria argue about the divorce. Maria says maybe Shane had better choose between her and Max. Maria says Shane is old enough to make up his mind. She says maybe it'd be good if Shane left home for a while. She doesn't want him to leave, but they can't go on rowing. Shane says he'll move in with Max - someone has to look after him. Shane says that Maria should never have come back to Max all those years ago, so Maria slaps him. Danny comes out wondering what's going on, but Maria sends him back to bed. Shane storms off to his room. Paul and Terry are sitting in his car talking about the movie they saw and then their families. They are getting on quite well. Terry is still a bit upset about Shane. Paul asks if she thinks Shane and Daphne will get back together. Terry doesn't think so. Danny sees Shane's things all packed up in boxes. Shane comes out of his room and tells Danny that he doesn't want to go, but it's time - he can't stay at home forever. Danny isn't impressed and wanders off to school. Maria comes out and says she can see Shane has made up his mind. Shane gives Maria the house key. Maria says that she doesn't want Shane to go, but he says it's too late - if he can't stay with Max, he'll have to find somewhere else. Shane has asked Max if he can move in - he thinks Shane's joking. Shane explains that he wants some more independence. Max suspects that Maria is sending Shane to keep an eye on him, but Shane assures him that there's nothing like that going on. He admits that he's not getting on very well with Maria at the moment. Max says Shane can move in - he'll send Terry over with the van to pick up Shane's stuff this afternoon. Lucy is writing a story titled, "The Girl Next Door". It's clearly about Scott's situation with Wendy(!). Scott isn't impressed and takes the story off her. He accuses Lucy of stealing his diary. She refuses to return it. He chases Lucy around the house! Max's flat is looking a lot tidier when Max and Terry come in. 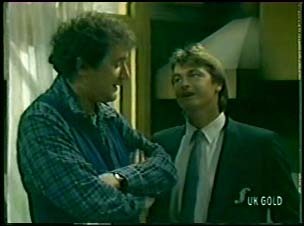 Max tells Terry that Shane is moving in with him. Terry is surprised and explains to Max that she's not going out with Shane anymore - she's going out with Paul Robinson now. Lucy is probing Wendy for details about Scott and Danny. She tells Lucy that Scott has a diary and she knows where it is. Wendy tries to bribe Lucy with nail varnish but Lucy would rather have a look through Wendy's wardrobe for something she likes. Shane and Wendy chat and Wendy tries to crack on to Shane. He tells her off and says she'd better stop giving Danny the run-around. Just then both Scott and Danny come in. Scott drags Lucy off to "do her homework". He tells her she'd better not have said anything. Terry gives Maria the key to the van. They talk about Terry's fight with Shane. Maria explains who the girl was the other night. She tells Terry off for not giving Shane a chance. Terry sees Shane crossing the road, but he won't talk to her. Terry follows Shane into the house to apologise to him. He ignores her and takes his stuff out to the van. Terry follows Shane down the driveway, telling him to stop running away from his problems. Finally he tells her that she's found someone new now. Terry says that Shane's done the same - he's been out with Daphne. Shane tells her to mind her own business. Wendy points out that Shane's tyre is flat. Terry offers to change it for him. Wendy comes round to see Lucy. She asks her about Scott's diary, but Lucy won't tell her where it is. Scott is suspicious. Suddenly Lucy goes to get the diary and gives it back to Scott. She also gives him her story to tear up. She asks Scott to help her with her story for school. Scott agrees. Some of the girls are laughing about Phil being a hunk and gossiping about Julie. Max is trying to set up a camp bed for Shane to the accompaniment of loud music from the next-door flat. Terry staggers up with a load of Shane's stuff. He asks her for a hand fixing the bed. Phil tells Julie that he needs to talk to her and asks her to have dinner with him tonight - he'll pick her up at 7.30pm. As she leaves, he calls her back and kisses her. A lady comes in to see the manager. She introduces herself as Mrs Philip Martin - Phil's wife. Julie is shocked.